Understand what your teenage daughter really means - and learn to use your arguments to strengthen your bond with her. Mothers and teenage daughters fight more that any other child-parent pair. On average a mother and a teenage daughter have an argument every two and a half days. Are teenage girls trying to push mothers away? Do mothers refuse to let go and give daughters the space they need? Are teenage daughters' battles brought on by raging hormones? These common assumptions are misleading. 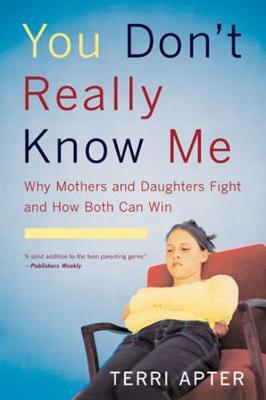 In this freshly written and accessible book (Times Literary Supplement), social psychologist Terri Apter shows that quarrels between mothers and daughters can be healthy and necessary for developing a daughter's sense of self. Through case studies of 59 mother/daughter pairs and conversations with mothers and daughters, both individually and together, Apter reveals the intimate world of the mother/daughter relationship. She shows the frustrations of both generations and offers concrete solutions - guidelines for dealing with inevitable quarrels, suggestions for diffusing the worst arguments, strategies for listening to an adolescent daughter, ways of discovering what an argument is really about, and examples of resolution and reconciliation. A solid addition to the teen parenting genre. Terri Apter is a writer, psychologist, and retired Fellow of Newnham College, Cambridge. Her nine books include The Sister Knot and What Do You Want from Me? She lives in Cambridge, England.